Every great band has its Pete Best, its Stephen “Tin Tin” Duffy, a founding member lost in the sudden onslaught of fame and fortune. 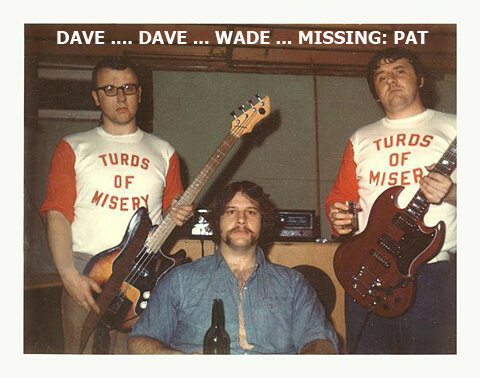 In the case of Davenport, Iowa’s Turds of Misery, that was the band’s original drummer. He isn’t in the famous photo, and he doesn’t remember why … although he acknowledges that he may have taken it. Pat emailed me today to share his memories of the band. I’ll just bet. Look at that photo … some of the most fun I’ve ever had has been down in the basement, with musical instruments and beer. I was the drummer, too, and also the least talented, especially in my basement. This has not changed, by the way. Well, I can relate to that, too. My memories of making music in my college days in the ’80s are pretty fuzzy, too. Our band was called The Rhythm Method, which makes me wish I had thought of Turds of Misery. Pat didn’t say what he’s doing now, but I checked the Foreigner website and he’s definitely not a member. Anyway, it was Laurie, the daughter of band member Dave (not the Dave who looks like Jakob, but the one who looks like Seth Rogen), who first turned me on to the Turds’ true history after I invented one of my own. Laurie then went on to set up a band website as a Father’s Day present, and told me on the weekend via email that she’s trying to convince Dave to write a full account of the band … and maybe even put together a reunion of sorts. This is the sort of thing that could work really well in the YouTube age. If it happens, I think I’ll put together the opening act. I’ll call it Bagpipes MacDonald.